Budding fashion designers love these! 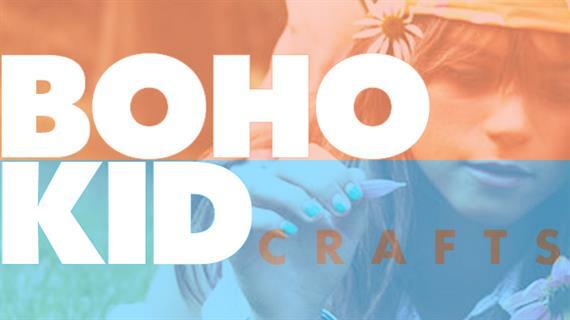 Learn a little history while crafting these simple bohemian-inspired projects with kids. If you have any budding fashion designers in your class, they will have a blast constructing some of the latest trends. Plus they will develop their critical-thinking skills while simultaneously constructing wearable art! Children learn about fractions and symmetry while creating a headpiece. They choose four pipe cleaners in two or more colors. First they twist two of the pipe cleaners to create a braided affect. Next they create the other half by twisting the other two pipe cleaners onto their design. This is a great opportunity to discuss fractions—two halves make a whole. You can also pose the question: What fraction of the colors was used for the design? 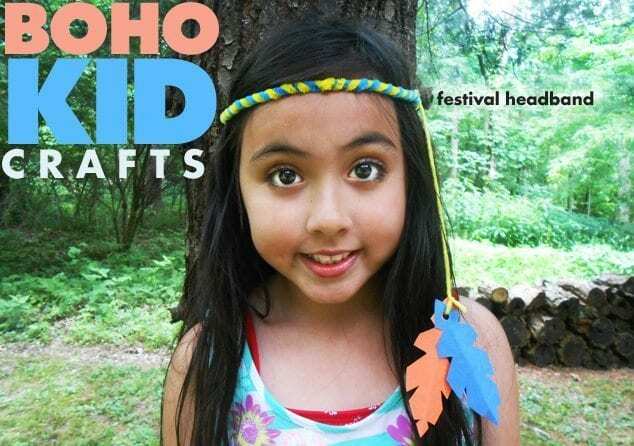 After children make the headband, they sketch a feather shape on construction paper. Then they fold it in half (line of symmetry) to cut out triangular shapes from the sides of their feather. Finally, they glue their feathers together at the top tip, punch a hole and strand them on a piece of yarn to tie on to their head piece. This art project incorporates science. Children go out on a nature scavenger hunt collecting various plants for their jewelry. They act as botanists by creating a collection of their findings from their expedition by pressing and preserving them . Students can compare their discoveries and help one another identify their plants. Afterward, have the students record facts about their plants. Is it vascular or nonvascular? Is it a flowering plant? Where and when did they find it? 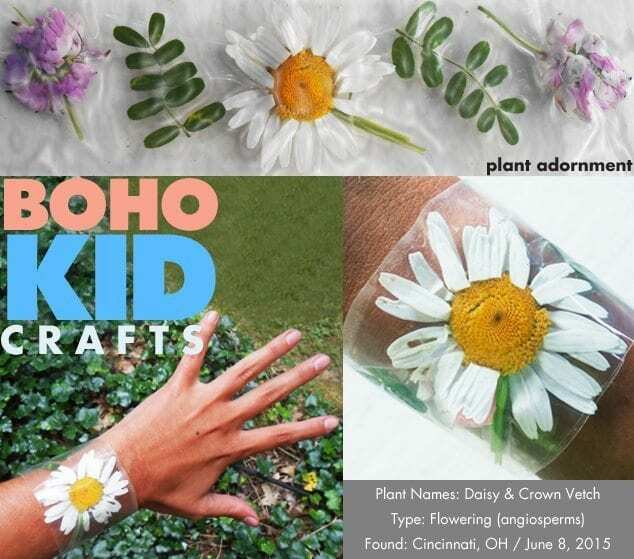 Instructions: After students have collected their plants, they use contact paper to create a bracelet or a pendant. They simply cut out a rectangle for a cuff or a circle (or any shape) to attach to string for a pendant. Note: I did not have contact paper and used packaging tape for a cuff bracelet. Students can get super-creative while making a one-of-a-kind ear adornment. This jewelry piece originated in 2000 BC and was called a kaffa. No piercing was required. The kaffa attached to the outside of the ear just like the ear cuffs we have today. 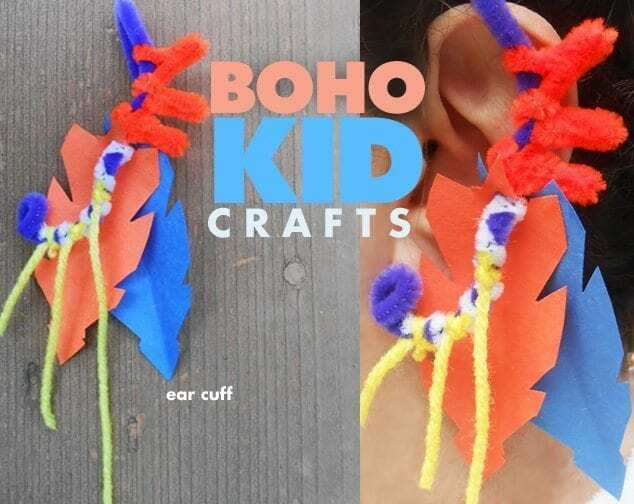 For this craft, have children take a pipe cleaner, hook it on their ear and figure out what they could add to it to make it unique. They could glue on gemstones, push beads onto it, tie flowers or make geometric shapes using other pipe cleaner colors. The math and science in this art project is figuring out a way to get their ear cuff to balance and stay in place on their ear. For my ear cuff, I created spikes with a pipe cleaner, chains with yarn and used paper for feathers. Students can create a wrist full of bangles by upcycling old materials. This is a great project to celebrate going green. Students turn old soda bottles into wearable art . Click here for a video tutorial . Bangles can also be used for a math lesson on patterns. Click here for a variety of designs. 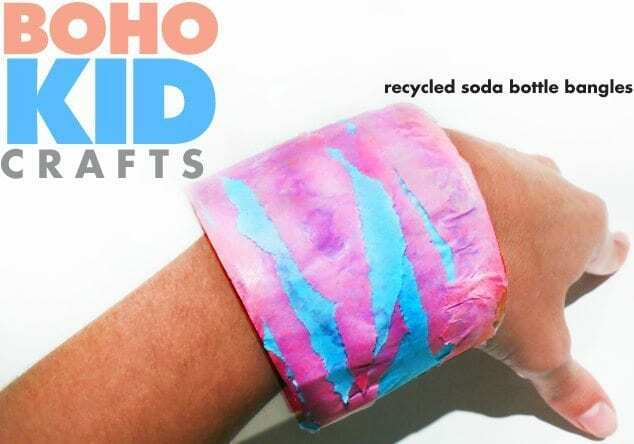 For my soda bottle bangle, I just glued tissue paper onto the plastic using school glue. 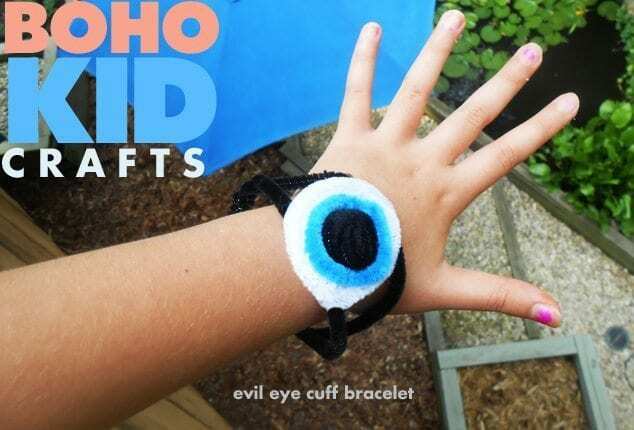 Evil-eye jewelry brings happiness to the wearer and provides protection from evil forces. With this project, children measure and twist, problem-solving how to piece their bracelet together. To make the cuff, take two pipe cleaners and line them up end-to-end. Take the tips of the pipe cleaners (two on each side) and make an X. Pull them out (making the X larger on both sides). There should be a gap in the middle (oval). When you have the desired size for your eye shape, widen the gap to create a wide oval. You should now have what looks like the letter V on both sides. Twist the V shapes on both sides to keep your oval secure. Then have children size the cuffs on their arms. Next children create a white circle (pipe cleaner) with an opening in the middle and twist it onto the middle of their cuff (oval opening). They do the same with their next color. Then for the pupil of their eye, they roll a black pipe cleaner like a snail and hook it in place. In Italy, a long, gently twisted horn-shaped amulet is a symbol that protects against the evil eye. Different crystals have different meanings. Some crystals also help soothe people. Horn: With this craft, children work with capacity and practice measuring by cooking up baking soda clay . Visit Etsy NY for the recipe . Once your clay is ready for sculpting, have students roll out a horn shape. Make a little hole in the horn to create a pendant. The clay takes about two days to dry. Once dry, string the horn pendant on yarn or a chain. 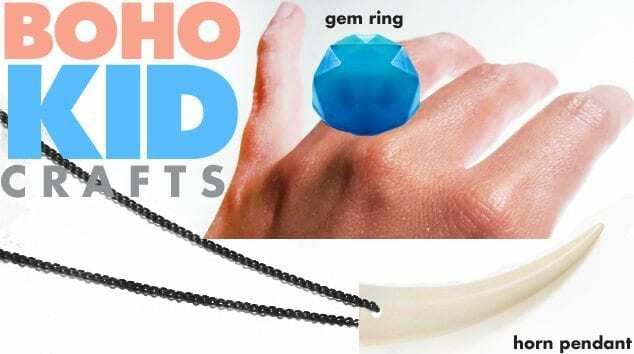 Gem Ring (or Crystal Pendant): You can create crystals using glycerin soap. Students can create a ring or turn their gem into a pendant. Clear glycerin is perfect to create a quartz-like crystal. Visit Mr. Printables for a tutorial.